Lead a full and healthy life! We will support you through every step of your journey. Karen Shann consults on alternate Thursdays at SuperPharmacyPlus. For appointments, please contact us. Please see our flyer below for more information. 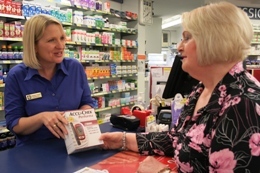 Whilst all our staff are trained in diabetes care, our Accredited Pharmacist can sit down with you and answer any questions or concerns you have about diabetes or monitoring your blood glucose levels. We're proud to be a National Diabetes Service Scheme Access Point. We stock a wide range of accesories including lancets, test strips, glucose monitors, insulin cold-wallets, alchol wipes and more. Click to browse our selection. For a more smartphone apps, visit our health information page. iPhone Android The Accu-Chek Connect diabetes management app provides easy tracking of your diabetes data. A choice of reports helps you identify trends and patterns in your blood sugar levels to support better management of your diabetes. Talk to our staff about receiving a FREE Accuchek meter here. iPhone Android Find out what's in the food you're eating and make simple switches to the healthier choices listed by the app for better health now and in the future. iPhone Android Glucose Buddy is a data storage utility for people with diabetes. 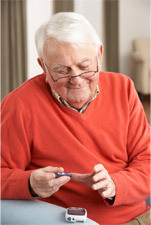 Users can log their Blood Glucose, Carbs (Food), Medication (Insulin Dosages), Activities, HbA1C, Blood Pressure, Weight. Android Manage diabetes better by tracking blood glucose, medication and other values. OnTrack is an application to help diabetics manage their diabetes by tracking various items such as blood glucose, food, medication, blood pressure (BP), pulse, exercise and weight. Confused by diabetic diets? Our dietitian can guide your diet without making eating a chore. Click here for more information about our dietitian. Check out our sugar-free range, including Sweetlife xylitol products.